subroutine You may install a piece of ice from HQ protecting another server, ignoring all costs. subroutine You may install a piece of ice from HQ in the next innermost position, protecting this server, ignoring all costs. Where does the Corp install the ice for Bloom's second subroutine? The ice is installed in the position closer to the server than Bloom where the Runner would approach it after passing Bloom. If the Corp uses Wormhole to resolve Bloom's first subroutine, where can the Corp install the ice? "Another server" refers to a server that Bloom is not currently protecting. If the Corp uses Wormhole to resolve Bloom's second subroutine, where can the Corp install the ice? The ice is installed exactly as directed: in the next innermost position from Bloom protecting the same server as Bloom. The two subroutines can make really deep servers and make this economical. If its own server and the other server we are installing in only has one ice, you are gaining 2 and 2 of economy in doing so. If we count its install cost plus click to install and click to draw, this makes this ice break-even the first time it fires. The second time that it fires we are gaining 4 and 2, which makes it more economical and all but the most extreme economy cards. The deeper your servers, the better this effect becomes. The second subroutine does what we always wanted minelayer to do: install closer to the server than itself. This change makes this way more powerful. This ice doesn't just build. It protects in the run it fires in! You get to install an end the run ice, or something really spiky. You do this knowing how much money the runner has and which ice he can and cannot break. There are other minor benefits to this as well: It makes postitional ice easier to play. This could help in building that deadly Cell Portal server. 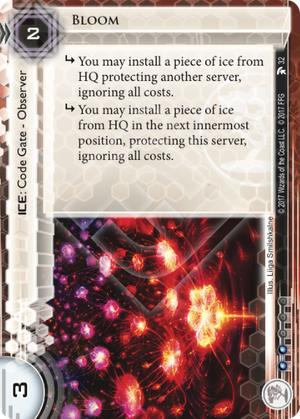 It also has some drawbacks: You need to play tons of ice before you can consider this card, because we are installing from HQ here. With no ice in HQ, this card is blank, though I often find ice piling up in my hand anyway. Also, it is weak to Yog.0, but then again it costs a fraction of that card. It is at home in glacier decks like NEXT Design: Guarding the Net if they can afford the influence. It works well in any glacier jinteki ID, like Tennin Institute: The Secrets Within, Pālanā Agroplex or especially Jinteki: Replicating Perfection.